In the next few days, we will have a new baby. I'm due anytime from now (actually yesterday) until whenever...I'm feeling the 24th...only because I THINK I remember one of the ultrasound dates said that, but who knows. In honor of him coming any second...haha! I thought I would share a few ideas of what I have packed in my bag. I also decided to interview a few other mamas and learn from what they've packed for their deliveries as well. There is so little you need for baby when you go to the hospital, they seriously give you EVERYTHING! 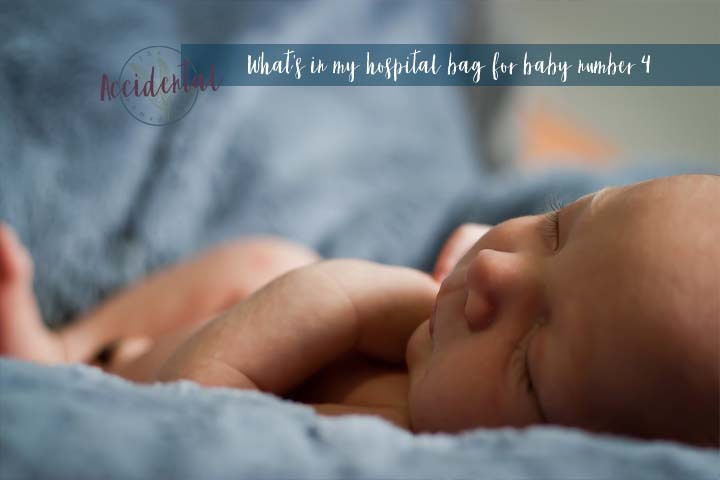 In my bag is my Boppy (because I don't nurse without it!!! 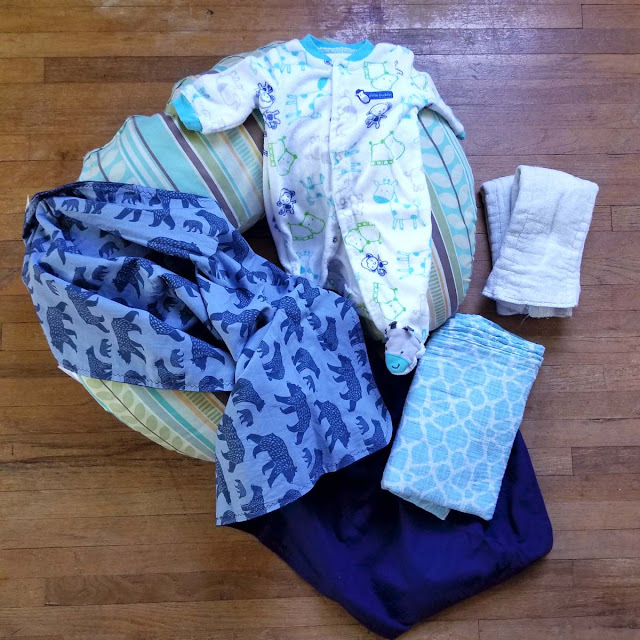 ), a cute little going home outfit, a light blanket, my Amana Design cozy blanket, and a couple of burp rags (if history can be any type of predictor for spit up). The hospital provides diapers, wipes, diaper cream, Vaseline, onsies/shirts...No need to bring your own. The rest is just excess. 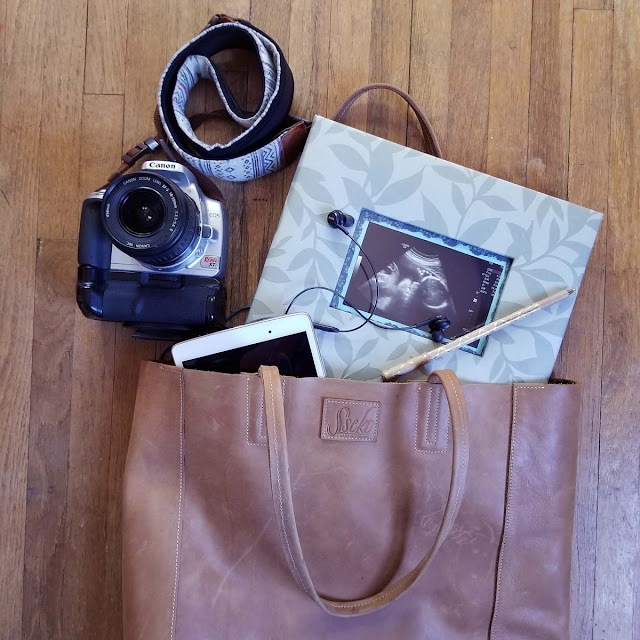 This is kind of a mix of mama and baby...The camera will be packed with full batteries and empty memory card, a baby book for collecting names, notes and baby footprints, the tablet to keep me busy when it's quiet, and a pen. This is where I tend to go super overkill and pack ALL. THE. THINGS. But this time I'm trying to be more realistic. We'll see how that goes! 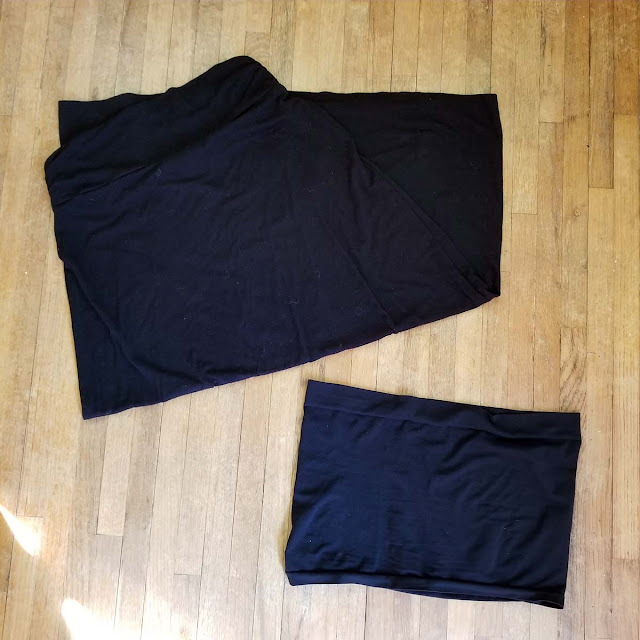 My friend Rachel gave me the ingenious idea for a dark skirt during labor. Last time, I had a sun dress on and don't have that one any more. Rachel had passed on some maternity things to me and guess what was in it? The Black Skirt. Brilliant! She also mentioned a belly band, something that I wouldn't have thought of. So, the skirt and the belly band will be my delivery outfit. I like as little as possible on so the belly band will be used to cover the ladies as I wander around waiting to push. If I do a water birth, I'll end up bare down below anyway. And then after delivery - hey-oh! There's a baby! I've got a sweatshirt that zips up, a flowy top, (not pictured) a black nursing tank & bra, and a pair of shorts. The shorts are going to be nice because they have compression shorts built in, they're also super soft (way to go walmart!) and will feel nice on my recovering lady parts. The socks are just in case I want warm feet. I may not. We'll see. Chances are, I'll sleep in this. It'll be light, warm enough, comfortable, and why bring more clothes than you need. Also, we're less than 10 minutes from the hospital, so if I do need something else, Andrew can run and get it. And going home. Someone had mentioned wearing a cotton dress, which sounds amazing, but I just don't have one that I'd look good in, postpartum and looking 20 weeks pregnant still. So, I opted for some maternity leggings (thanks for the hand-me-down, Caitlin! ), a light, flowy t-shirt and not knowing the weather, a light cardigan to make me feel a little extra covered. It should be fairly comfortable and cute enough for the inevitable stop that we'll have to make on the way home. Not pictured, I HAVE to bring my own blanket and pillow - I just don't sleep without them. I also always bring my own towel, not because I can't use another, but because this one is GIGANTIC. I also just bring the daily essentials that make me feel human. 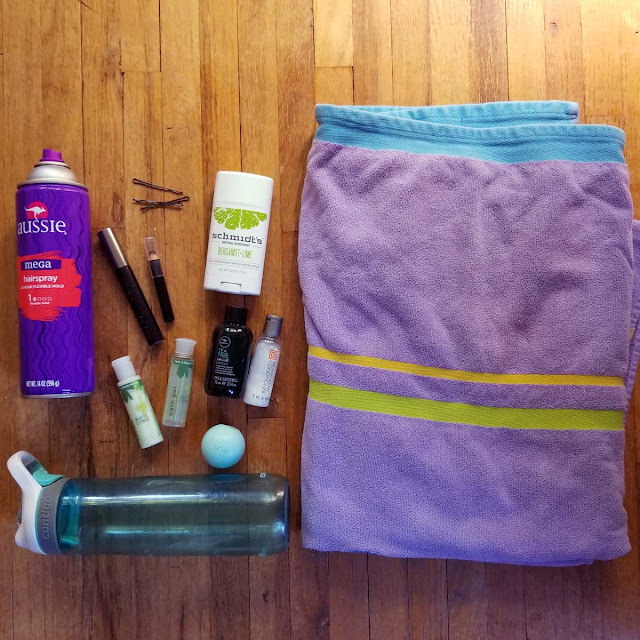 Mascara and eyeliner to look nice in pictures, some hair spray, just because, shower items because it feels AMAZING to take a shower after pushing a baby out, deodorant - no explanation needed, bobby pins (I don't bring a pony tail because of how short my hair is), chapstick, and my water bottle. The hospital does provide a water bottle for you, but I'll have mine with me regardless because water is kind of my "survival" thing, with our first baby, I made Andrew go to a gas station to get one while we were on the way to the hospital. For Andrew, I pack a few comfortable things. 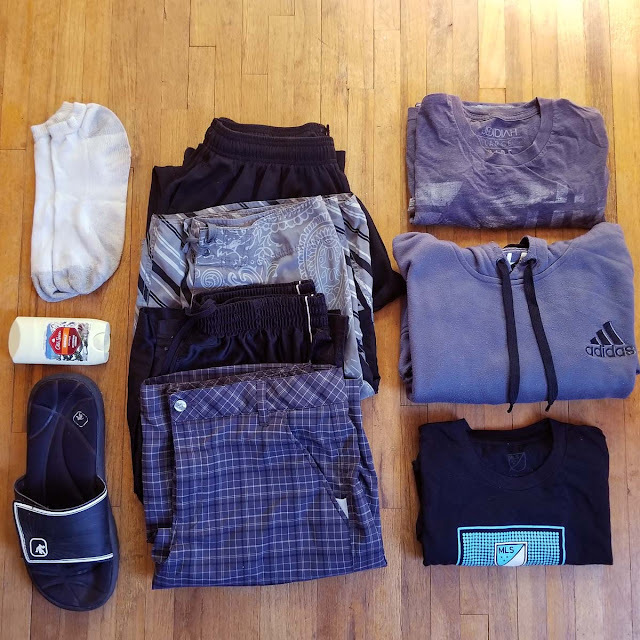 Some sandals, a pair of socks, I have two tshirts packed, in case I do a water birth and he wants to come in with me, you'll also notice some grey swim trunks for the same reason. 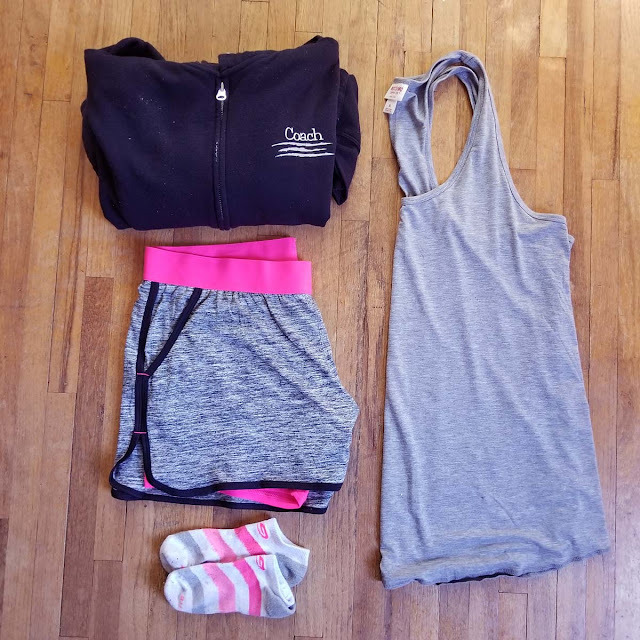 I also bring him a pair of athletic shorts to wear, a pair of sweatpants, a sweatshirt, and an outfit to go home in. My towel (previously mentioned) may end up being his towel in case of a water birth too. I'll also bring his toiletry items and a blanket and pillow. The hospital doesn't usually provide that kind of thing for hubby, if I remember right. I'll probably have a few snacks packed, some Tums (just because), a game, and perhaps a few things for the boys to do when they come to visit. Our hospital has a great snack bar for mom so I won't need to bring much, but I may bring a few things that I know I will crave and PROBABLY won't be on the menu there. It was such fun to ask other mamas what they bring, I thought I'd share some of their answers here in case you want to consider any of them for yourself! The last thing that I want to mention is from a friend, I've never done it, but the idea is just ingenious!!! She said, buy a special, and "new to you" scent of lotion & body wash from bath & body (or equivalent) for each delivery! So smart. It triggers your memory and takes you right back to that day and that baby! The key in the end is to just pack what YOU need, what YOU want, and what is going to make YOU comfortable. It's different for everyone and there are never ending lists of what you should or shouldn't bring. What did you or did you not bring that made your stay easier?